The enclosing of cellular components by a membrane of fatty acids is perhaps one of the most controversial steps in the process of the formation of the first cells. It seems clear that all current cellular types, bacteria, archaea and eukaryotes, proceed from a common ancestor, known as LUCA ("last universal common ancestor"). All of them possess a cytoplasm with a reducing environment, neutral pH and a characteristic concentration of determinate types of ions. Therefore, it is though that the environment in which the first cells appeared could be similar to the cytoplasm of current cells. This means that the place where the first cells appeared would not be the sea but freshwater. It is known that the spontaneous formation of lipid bilayers in salty environments is difficult. The formation of lipid bilayers is simple in aqueous environments and these molecules can be synthesized without cellular intervention. In fact, lipids extracted from the Murchinson meteorite, fallen in Australia, are able to form vesicles with bilaminar membranes. These lipids possess simple chains of fatty acids, contrary to what occurs in the current membranes that have two chains of fatty acids. Nevertheless, how they managed to form enclosed compartments with all the necessary components to evolve until the current cells? The life inside the vesicle. This model proposes that layers of lipids, by means of the action of the wind and of small waves, will reorganize to form small vesicles or small bags where the necessary molecules to make independent all the system would remain enclosed together. An objection to this model is that the lipid bilayer is sufficiently impermeable as to prevent an appropriate communication between the external and the internal environments. By that period, purportedly, there were not transmembrane proteins functioning as carriers or channels.. The life outside the vesicle. Due to the shortcomings of the previous theory, it was thought to turn it around. The metabolic routes that constituted the original cells were not inside the vesicle, but out of her. It was postulated that a mineral environment would create an appropriate media for chemical reactions. The molecules of these reactions would have a membrane on the other side, like a sandwich. The molecules would not be lost by diffusion because some of them could join the membrane forming some kind of gel around her. Those molecules would be the forerunners of the cytoskeleton. A support to this idea is that proteins homologous to actin and tubulin, components of the actin filaments and of the microtubules, respectively, that form part of the cytoskeleton, are present in all cell types. There is an alternative proposal suggesting also that everything began out of the vesicle, but without the need of minerals for catalyzing reactions. It has been shown that lipid membranes are appropriate sites for some chemical reactions to take place. In fact, it is known that some molecules, such as bases and simple amino acids, are more stable associated to the membranes where they can concentrate, favoring the chemical reactions. In such a way that membranes themselves would favor the union of some molecules but no others, somehow explaining how the selection of the molecules that form cells began. These simple molecules, afterwards becoming more complex, would stabilize the membranes, so that all would be benefit. The process evolved until creating a complex system around the membrane in which the interactions and the dependency was every time greater. Some molecules were inserted in the membrane and the forerunners of the cytoskeleton could shape it. At a certain time, an invagination was produced, so that part of this system remained enclosed by a double membrane. The external membrane would disappear over time, freeing all the protocells that would have created by invagination. Therefore, the external environment of the vesicle turned into the internal environment of the cell. The role of the rudimentary cytoskeleton appears to be transcendental in all this process. 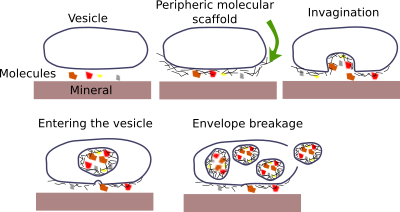 This process of invagination, where a double membrane surrounds some structures, occurs in some processes of current cells, such as the formation of spores in yeasts, the autophagy of organelles in eukaryotic cells or the exit of some virus from the infected cells; this enclosed process could even originate the nuclear envelope. It was also proposed that the same process could form eukaryotic cells. The life outside the vesicle model. The vesicle is formed by a bilaminar membrane (modified of Griffths, 2007). 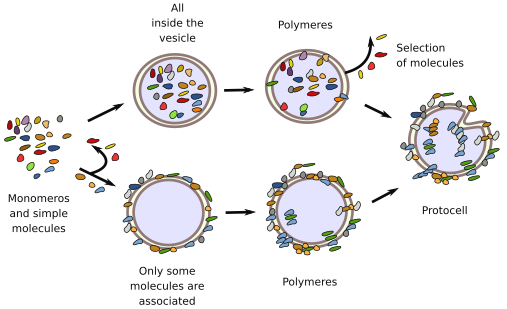 The life ouside the vesicle model (upper path).The membrane is the key element to select, concentrate and favor the reactions of the molecules (modified from Black and Blosser, 2016). Griffiths G. 2007. Cell evolution and the problem of membrane topology. Nat Rev Mol Cell Biol. doi:10.1038/nrm2287.